The state of California is making a new move in the dispute over abortion in the United States. In January, state lawmakers voted to require all 34 public universities in California to offer students medication to induce abortion. In order to become law, the bill will need to be approved by the Assembly. A medication abortion permits a woman to force a miscarriage by taking two pills within the first 10 weeks of becoming pregnant. Since the option came available to women in the U.S. in 2000, medical abortions have become more common as a way to end a pregnancy. Today, they account for more than 20 percent of U.S. abortions, says the Centers for Disease Control and Prevention. 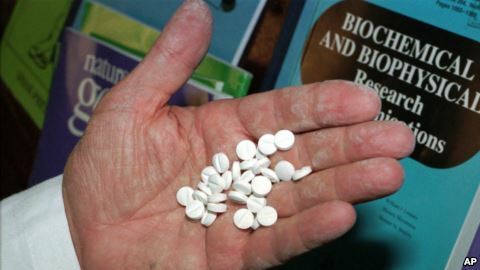 The World Health Organization (WHO) reports medication abortions are also increasing worldwide, both as legal and secret measures. The WHO says the number of medical abortions has “likely contributed” to lower rates of secret abortions that result in injury and death to women. But few U.S. colleges provide medication abortions. And none of California’s public universities currently offers them. The latest move to require University of California and California State schools to offer the service has introduced another point of debate in an already severely disputed issue. University of California campus in Los Angeles. Why is the move controversial? Abortion has been legal in the U.S. since the 1973 Supreme Court decision called Roe versus Wade. But that decision also says that states can make some restrictions on abortion. For example, many states require women seeking abortions to wait a certain number of weeks or to have an ultrasound – a medical test that allows them to see inside their uterus. And regardless of national or state laws, public and political opinions about abortion in the U.S. remain sharply divided. 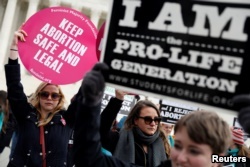 Opponents of the California state senate decision include the Students for Life of America. The group aims to end abortion not only on campuses, but across the country. A spokesperson for the group, Kristi Hamrick, told VOA over email: “There are no educational goals that will be met by expanding a university’s mandate to include ending pre-born life.” Hamrick adds that schools should be concerned with students’ safety; yet, the president of the Students for Life group says medication abortions bring dangerous risks to women. 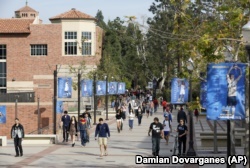 The California Family Council said the state had gone too far in this case, and even some California State University officials expressed concern about the details of the proposal. A spokesperson for the CSU chancellor’s office says the requirement will impose high costs for insurance, safety measures, medical training, and 24-hour support for medical emergencies. Pro-life and pro-choice activists gather at the Supreme Court for the National March for Life rally in Washington, D.C., Jan. 27, 2017. But people who support the bill see many benefits. Senator Connie Leyva wrote the bill. She said that, for women seeking an abortion, acting quickly is important. Providing the medication on campus will ensure that women do not need a car or will have to miss class to find a doctor. 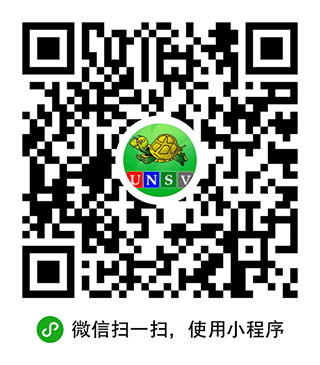 And the student clinic will accept a student’s health insurance plan. 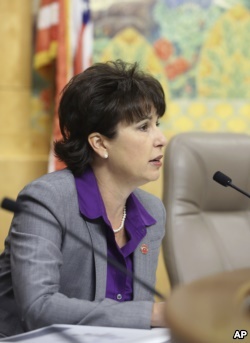 FILE - In this April 22, 2015 file photo, Sen. Connie Leyva, D-Chino, works at the Capitol in Sacramento, Calif. Leyva's bill SB320 would require all university campuses to offer medication abortion by Jan. 1, 2022. If the bill to require medication abortions on California public universities passes, a group of private donors plans to help fund the effort. They say they will pay for up to $20 million in startup costs, including equipment and training for the staff. “We believe that if they just learned what was required and were trained that they would realize that it’s very straightforward and a huge, huge value to their patients,” said Dr. Ruth Shaber. Shaber leads the Tara Foundation, one of the promised donors. The bill’s sponsors estimate that between 19 and 32 students on California campuses would seek a medication abortion each month. Kelly Jean Kelly wrote this story for VOA Learning English with additional reporting from Jonathan Cooper of the Associated Press. Hai Do was the editor.